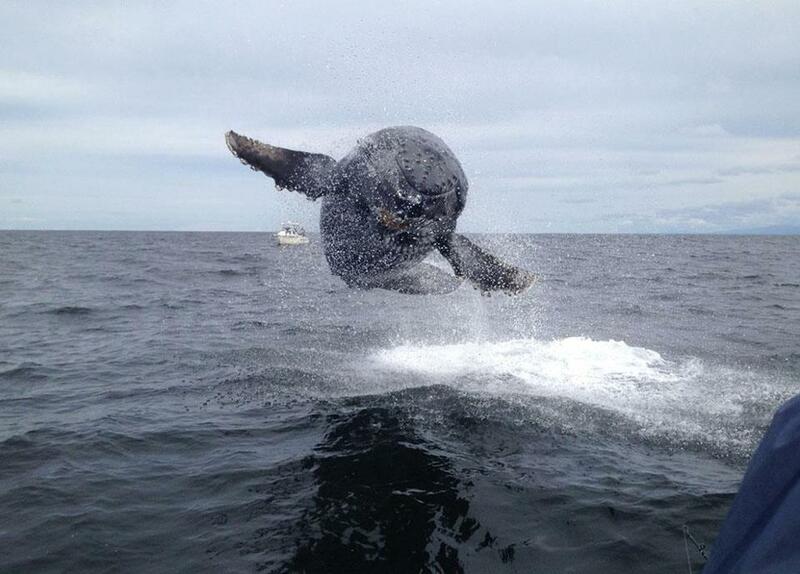 It’s a bird, it’s a plane, it’s a … whale? This humpback whale calf takes breaching to a whole new level. Completely clearing the water, it appears to fly in the air, fins spread out. Adult humpback whales weigh about 80,000 pounds (36,000 kg) and measure an average of 39 to 52 feet in length (12-16 metres), and even calves weigh two tons and are 20 feet at birth, so that’s a pretty powerful animal. Captured by Matthew Thornton, this photo was a National Geographic Traveler Photo Contest entry. It was taken off the coast of Tofino, British Columbia. The divers found themselves unexpectedly in the way of the whales as they were feeding on a school of small fish; one of the divers appears to be only two or three feet away. There has been some discussion about whether the diver would have been all right if he had ended up inside the whale’s mouth. The conclusion was that the whale probably couldn’t have swallowed him due to the size of its esophagus, but it might have had trouble “spitting” him out. It is likely the diver would have been partially trapped in the whale’s mouth until he drowned. Close calls like this are rare, so the video has internet commenters speculating about the “what ifs,” had the situation had a less happy ending. I agree with rod. Senseless, selfish and stupid to invade the whales space this closely.